“What’s the plan for today?” I asked Ruchi, hesitantly. Ruchi, one of my close friend’s gf. I had never met her before until last week when she came to Hyderabad for some business. It was the previous day I met her. My friend Neer keeps talking about her, that’s how I know her. I have talked to her before, occassionally but never got a chance to meet her in person. Ruchi’s interview was over, she got one more day before returning to Mumbai. Ruchi is a bright girl but that doesn’t guarantee her performance in the interview. “Probably she is stressed, probably she’s tired… But it’s her first time here. I should offer her to visit some places with me.” Ruchi had company, she could go hangout with them even if I don’t involve myself. Despite all these thoughts, I asked her. “We are quite tired after the long day(yesterday). Probably we’ll go out and you have to come. They are also asking you to come. It’ll be fun.” She sounded like she knows me for a long time! I responded to her affirmatively, suggested some places that were not that tiring to visit. Maybe I can sacrifice my long afternoon nap for one day and act like a social person. Meanwhile I finished doing the laundry and cleaning the room, took a shower, had lunch and got ready. Obviously having fun doesn’t mean, somebody else would finish my household works. “Be there by 2.30” she informed. I started by 2 and it was a one-hour journey. As it was a share ride, I had to travel with 2 other people. The guy sat at the front, the girl sat at the back next to me. She had her backpack between us. For 80 percent of the time, she was reading a notebook. Out of curiosity I looked at the book once or twice but couldn’t comprehend what the subject was. For the last 10-15 minutes of her journey, she gave up reading and leaned on the seat to take rest. Probably she fell asleep as well. I was seating next to her, not caring to check time or anything. It was still drizzling, I filled my lungs with the cool air and started day-dreaming. 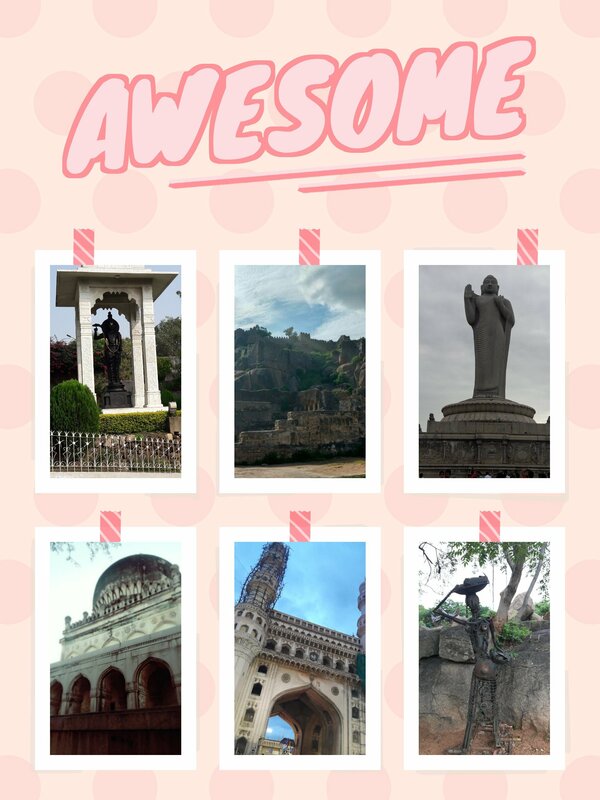 My first destination was Birla temple(top left corner pic). I suggest everyone to visit Birla temple in Hyderabad. It’s truly beautiful from inside and outside. Moreover, you can get a nice view of the city, the Hussain Sagar lake (There’s a Buddha statue at the center of the lake, top right corner pic), the necklace road and many more if you can identify. The visitors are not allowed to take mobile or camera with them but you can see plenty of photos on internet. It’s built on top of a small hill. There are still remains of the rock that you will see as you climb to the top. It’s best to visit at the time of sunset, at daytime the floor gets too hot to walk on by bare foot. As I reached there, Ruchi and her friends were already waiting for me. We climbed to the top, did our prayer and found a convenient place to sit and relax. Ruchi’s friends seemed to be very simple and fun-loving. I didn’t feel like they were complete strangers to me. We played a guessing game while sitting there, we were divided into 2 teams, 1 person from each team would be given a movie name. He/she has to act it out, if the team can guess the movie name correctly, it gets a point. Acting out something while 2-3 people would look at you at the same time- I couldn’t handle that. I was helping my team with the guessing. After we sat there for a while, we started for Charminar (middle photo at bottom). It was about half an hour’s car ride from Birla temple. By the time we reached there, it was evening. This was my 1st visit to Charminar. People who had warned me, “Do not have much expectation. There’s nothing much to see.” I agree and disagree to that at the same time. People who have visited a lot of places have a certain amount of expectation. You should not stop yourself from visiting a place just because somebody else didn’t like it. See for yourself and then decide if you like it or not. There are street markets people talk about, mostly I saw accessories, dresses and shoes. It started raining heaving just after 10 minutes of our arrival. After that there was nothing much to do. We took shelter in the shop with the crowd for an hour. We couldn’t get any cab so decided to have dinner instead. Hotel Shadab was in walking distance but in that rain it felt like miles apart. It was all Ruchi’s friends’ idea, I didn’t have much input in that. The dinner was fine, the biriyani was quite nice, the starters were average. Even after our dinner, there was no cabs available. The guys with us went to every other auto and finally one guy was convinced. We had to break our journey as the auto driver was not ready to go such a long distance. There was a little bit inconvenience here and there but there was no complaints from Ruchi. She adjusted herself in every situation. I was amazed to see that her friends voluntarily took her backpack. All of them were so concerned about her, watching her every step, protecting her. It was past 10 PM, we were still on our way. Ruchi’s parents got stressed and she had a small argument with them over the call. Girls’ safety is the topmost concern of our parents. Even though she wasn’t alone, her parents anxiety wasn’t hard to know. Our parents concern is not irrational considering the current situation. Even my parents become upset if I stay outside after my office hours. We reached home safely, I bade her goodbye and wished her a safe journey. I came to know, the guys we were travelling with were not her friends. One of them was her colleague, the others were his friend. She met them at the same day I met her. As an introvert, I prefer to stay at home most of the time. Meeting with people, talking to them drains my energy. But on that day I realized hanging out with good people didn’t drain my energy rather you felt positive. Friendship cannot be defined by how long you know a person, someone you met 2 months ago can be a better friend to you than someone you know for years. So be welcoming to every person who give you positive vibes in your life.